This blog will feature original writings by Master Scott C. Homschek, Chief Instructor of River Valley Tang Soo Do Academy, and his students. The writings in this Blog will relate to martial arts training in general and Tang Soo Do specifically. A Martial Artist Knows…Self esteem is not gained by meeting lowered standards. A great deal of emphasis is placed on nurturing the self esteem of our children today. The problem arises when we as the adults and mentors give acclaim to children when they have not really accomplished anything, or worse yet heap praise upon them for mediocre or sub standard performance. Whether we are talking about not keeping score in little league baseball because we don’t want the losing teams feelings to be hurt or, in the academic world, allowing the educational standards to be lowered so more students can receive A’s or at least passing grades. In these cases the egos of the adults are being raised as they make themselves feel better because they think they have helped the kids feel better about their performance; when in reality they have only deluded themselves and the children. We all know that the kids in the baseball game are keeping score even if the adults are not. We also know that reducing the expectations for passing grades does not make our kids smarter – indeed it rewards them for developing a poor work ethic. Over time if we continue to lower the standards and allow them to pass they understand that with less work on their part the adults will conform to their wants and lower the work expectations. Indeed we are seeing now the effect of decades of continuing lowered expectations and the negative impact it has on society. We have seen the same thing happen within the martial arts industry. Instructors who have been afraid of losing students have lowered the performance expectations they have for students to advance to the next rank. These students, if they continue in their respective art, become the future teachers of the art and will lower the expectations further. Today I see many students strutting around in their Black Belts who cannot fight their way out of a wet paper bag and they know it. We have exchanged Self Esteem for over inflated Egos. Regardless of the aspect of society we are discussing (sports, education, home) true personal growth and development of our children only results when clear expectations are communicated to them and they are then held to those expectations. Once one level of expectations is met a new more challenging expectation needs to be set. Time and time again I have seen a child struggle with material in our classes, work on it and then smile ear to ear when they finally figure out the challenge. In the martial arts the successful completion of one challenge sets the foundational skills needed for the next challenge. With time the challenges get increasingly more difficult. As beginners these challenges can be overcome in a few minutes with proper instruction. As they progress in rank students see the time to achieve the goal goes from minutes, to tens of minutes, to classes, to multiple classes, to weeks, months and even years. In the martial arts world we do not give students self esteem we help them build it, one technique at a time. Building self esteem necessitates increasing complex challenges. If a child were to go to school every day and all the math teacher taught was 1+1=2 they would be bored senseless by day #2. 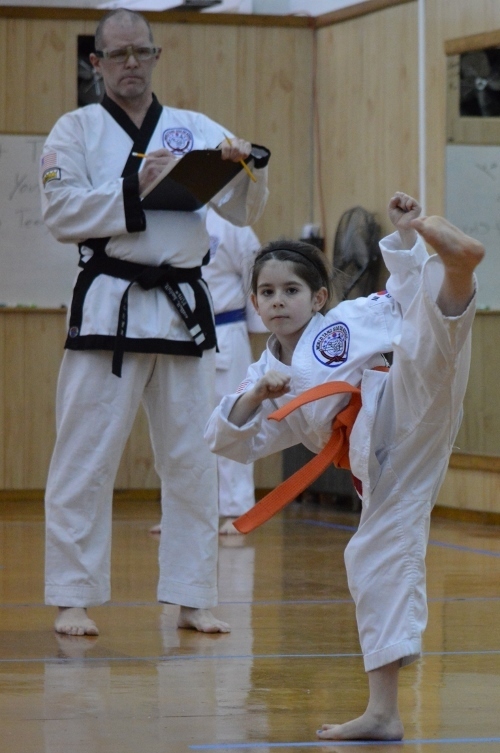 Martial Arts is no different – teach them proper stance so we can teach them how to kick. Their first kick is slow and easy at knee level, when they can consistently execute that kick hitting their target; keeping their hands up, maintaining their balance it is time to increase the height of the kick. When they have maximized the height of their kicks we might add a jump to the kick or a spin, followed by both a jump and a spin and then multiple kicks in the air. 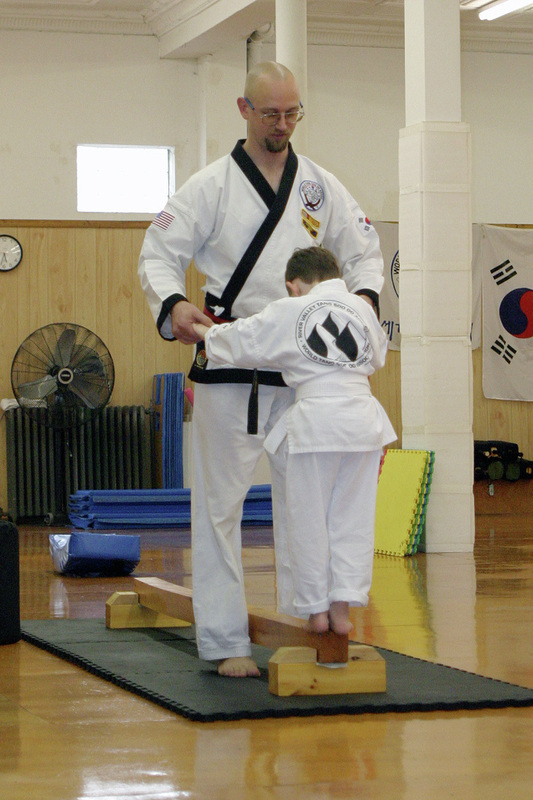 At each stage the student is given praise, WHEN and IF, they perform the technique well. I have no problem giving very enthusiastic praise to a student who really deserves it. What serves no purpose is praising techniques that are substandard. Along with this is the understanding that not everyone should be a Black Belt, an Eagle Scout, or top of their class. The truth of the matter is not everyone is willing to work hard enough to reach these levels. Too many “Adults” are unwilling to be the person who says “You are not ready.” They are too focused on being the child’s friend instead of being their mentor; they allow subpar performance for which they heap on the praises. The adult in this situation is not only feeding the ego of the child they are also feeding their own ego. They want to boast and say “I have 100 Black Belts”. If they are artificially allowing student to advance to feed their own egos they are breaking the unwritten contract of the student who says teach me. Teaching involves teaching the easy paths as well as the hard lessons when needed. Teaching our children means setting the learning field, showing them the tools, setting expectations and then giving them honest feedback on their performance. Our job as the adults is to deliver our children into adulthood well prepared to deal with all that life will put in front of them. A major part of this task involves showing them how to build their own self esteem. If we teach them to love a challenge, there is no challenge they will be unprepared to face. 1) Self esteem is not gained by meeting lowered standards. 2) Reality is not graded on a curve. 3) Confidence is the difference between knowing and wanting. 4) Winners look for solutions; losers look to assign blame. 5) There are no mediocre techniques; only mediocre effort. 6) There is no substitute for personal responsibility. 7) If you are not willing to step up you should step out of the way. 8) Inability is not disgraceful; lack of effort is. 9) If you expect to succeed embrace hard work. I like to put thoughts on the marker board for my students to contemplate. The list above represents original thoughts that occurred to me over the last few years. There were a number of additional ones that I neglected to write down and they are lost to history; or at the very least lost until they resurface in my memory. As I started to accumulate the individual thoughts it came to me that combining them into a single list would be an excellent way to concisely communicate the ideals of our martial arts training that I would like my students to strive for. In essence the list represents the guiding principles for River Valley Tang Soo Do Academy. After showing the list to a few of my high ranking students they convinced me it would make a great T-shirt for the studio. This led me to copyright the work and then begin putting together the graphics for the T-shirt design. The shirts were a tremendous hit at the studio and well received when presented to my martial arts friends as gifts. I will be using future blog postings to elaborate on each of the statements; explaining why it is important to martial artist in their training and more importantly why it is important to being a healthy member of society at large. Truth is not the purview of the martial arts – truth is universal and should be faced boldly whenever and wherever it is met. Shying away from the truth is the beginning of self deceit and ultimately personal and societal deconstruction. I hope you enjoy the series and welcome your comments and thoughts. Ok what’s the deal – what does baking cupcakes have to do with martial arts. Nothing – however testing the cupcakes to see if they are done is exactly what we do when we test our students for advanced rank. Many students, and parents, put a lot of emphasis on a student’s performance at a test. Traditionally the Master or Chief Instructor would tell the student they are ready to test and then put them through their paces in a formal setting. Regardless of whether the student thought they were ready their instructor was usually pretty confident they knew what the outcome would be. In many ways this was not really a test of the student instead it was a test of the instructor’s perception of the student’s ability. Yes, the student “took” the test but the decision to test or not, was not really theirs. A number of years ago I turned the traditional sense of martial arts testing on its head. Instead of telling the student they were testing I allowed them to “Request permission to take the entrance exam for next rank”. Once a student had met the requirements in regards to a minimum number of classes and a minimum amount of time since their last promotion they could submit a “Request to Test”. I was, and still am, pleasantly surprised by the students who were able to self evaluate well enough to know they were ready and those who would say not yet and voluntarily hold themselves back. So where do the cupcakes come in…. I am getting there. Does this mean everyone who participated in the test passed? Absolutely not! If there is no risk of failure then it is not really a test; instead it is merely a formality that does not serve to help the student grow and develop. When we started this new process students who were not ready, yet put themselves up for testing, learned a valuable life lesson on honestly assessing their own abilities. They learned to only “Request to Test” when they truly felt ready and not just because they “wanted” the next rank. As time passed and we continued this “Request to Test” process I was able to discuss with students why they should not want to move to the next rank too soon. I explained that a student who was struggling with their current material would find it no easier moving up to the next rank because we would only be adding more challenging material to their list of required knowledge. Having this discussion with a student, or parent, after a student had failed the test allowed them to understand why they were not advancing but it did not take the sting out of the failure. That’s where the cupcakes come in. To help remove the sting of failing a test I began discussing during the classes leading up to the test the purpose of the test and more importantly the “Cupcake Analogy”. 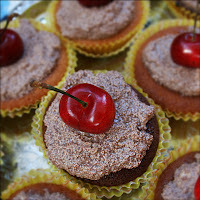 What is the “Cupcake Analogy” simply this – ask your students if they know how to or have helped bake cupcakes? Then ask if they know how to “test” if they are done? If you are not familiar with baking cupcakes the answer is you stick a tooth pick in them and pull it out. If there is “goo” on the tooth pick when you pull it out, what do you know? The cupcakes are not done. If the tooth pick comes out clean they are done baking and are ready for the next step – icing! The poke with the tooth pick is a test, what does it do? It provides us with information. A martial arts test, or any test for that matter, is no different; it merely provides us with information that will help us make a decision on what happens next. In the case of the cupcake – if there is “goo” we need to put the cupcakes back in the oven to cook some more. In the case of the student if the test results say the student is not ready then they need to go back and finish cooking – they need more time in their current rank before we begin putting more challenging material on their plate. I emphasize in class and at the testing event that the results of the test will be neither good nor bad – it will just provide us with information to help guide us to what needs to happen next. By discussing this ahead of time in this manner we alleviate the negative stigma of not passing their test. There are no repercussions after the test for not passing – we simply help the student to refocus by giving them detailed feedback on where they performed strongly and which areas need work. We spend time working with them on the areas of deficiency and start looking down the road to having them ready for the next formal test. By putting the decision to test or not into the student’s hands it truly becomes a test for them. They need to self assess beforehand to ask themselves if they are ready and then test whether their observations are correct or not. We as the examiners and instructors are the ones who administer the test and decide the final result. The ability to self evaluate is a critical skill necessary for success in martial arts and in life. Utilizing this process we help our students fine tune this skill and learn to make the right decisions in the circumstances life throws at them. Now time to bake some more cupcakes! As a beginning student I was taught that our basic forms for white belts consisted of twenty techniques and should be performed in 30-35 seconds. This was constantly reinforced while we trained. It was only after I had my own studio and had been teaching a number of years that I discovered this is not the only speed at which to perform our forms. Further investigation and experimentation leads me to believe that there are 5 speeds at which forms are to be practiced. When we as instructors introduce a new form to a student it takes a considerable amount of time to educate them on just the pattern of the form. Typically in teaching speed we start by instructing the student in the gross motor skills of 2-4 techniques in the form. We have them repeat those few moves until we are satisfied that they have programmed the fundamental muscle memory of those techniques and can repeat them back without assistance. We then add the next few techniques in the form and have them go back and repeat all the moves from the beginning of the form to their new stop point. This cycle of showing a few moves, repetition from beginning to the new stop point, evaluating the student’s ability to recall without assistance then adding additional techniques continues until the student has the fundamental skills of all the techniques in the form. This process may take an entire class, or it may be spread out over a number of classes depending on the complexity of the form and the learning ability of the student. There is no set time to accomplish the task – the focus is on setting the foundation of the form so that the student will be able to go home and properly practice the pattern (as much as they have been shown) before returning to next class. Learning Speed builds on the foundation established in the Teaching Speed portion of learning. In this phase the student methodically goes through the form seeking to understand the applications (bunkai) of the individual techniques in the form. This is the student’s personal discovery phase – this is where they explore all the facets of the form in hopes of unlocking the gems of knowledge the Master who created the form wished to impart. 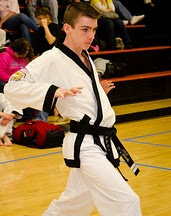 The student will often return to learning speed throughout their martial journey as they gain in experience they begin to see there is not one application to a technique in a form but many applications. The movements of the form are like tools in their tool box, or paint on a palette, what the craftsman can build or the artist can paint with those tools is endless. Training in Practice Speed is the traditional timing our instructors told us the form should take. For the basic form of twenty moves I mentioned earlier this is the 30-35 seconds. The student seeks to polish the skills they have discovered in the Learning Speed phase by repetition, repetition, repetition. The student is taking the time to execute the best technique they can and performing a self evaluation of the technique before proceeding on to the next. At the completion of each technique they can assess: the speed they executed the technique, the efficiency of power generation, proper targeting, quality of posture and stance, correct mechanics as they transition from the previous move into the current, etc... 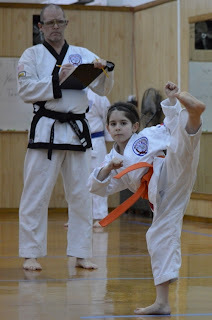 In short the student is focused on a constant improvement in their technique. We do not want the student mindlessly practicing the moves over and over without focusing on specific goals. Instead they should be seeking to critically analyzing each technique as they do them; acknowledging what they have performed well and always giving themselves a goal for improvement next time. Assuming the student has properly applied the learning in the three prior speeds this is the stage where they get to demonstrate their competency in executing the techniques. Demonstration Speed can be seen when the student performs the form in a testing format, a public demonstration or during training when they want to attain the state of empty mind, or movement without thought. (Moo Shim). The well trained body is freed of limitation and allowed to express what it knows. Typically this speed is 25-33% faster than Practice Speed. There is no time restriction put on the student, rather a quality restriction – the student should only perform the form as fast as they can while still maintaining the proper quality of motion (posture, stance, targeting, balance, etc…) that is necessary to correctly execute the techniques. When the quality of motion breaks down the student is no longer in Demonstration Speed they are entering Combat Speed. In Combat Speed the student pushes themselves to the limit – all out effort – full throttle. At the end of a Combat Speed form the student should be breathing very hard near the point of exhaustion. The goal in this phase is for the student to execute the form as fast as they possibly can; there is no time to worry about mistakes that are made because you have to move onto the next movement. The student need not be concerned that their stance is not perfect or their techniques are not flawless – this is a fight – hit the target and move onto the next objective. As instructors we need to educate our student on all five of these aspects of training their form. We also need to be sure they spend an appropriate amount of time in each speed. Most students will want to gravitate to the faster speeds before they are truly ready for them. That is where we as the instructors come in to keep their egos in check and their focus on the right track to proper learning.